As of 2017, there were over 250 000 children in ‘Converter Academies’, 86, 000 students in sponsored academies, and 170 000 students in LEA maintained schools. This that in 2017 there were twice as many students in converter and sponsored academies combined as there are in LEA funded mainstream schools…. Free Schools, meanwhile, cater to only just over 3000 students, with studio schools the least popular type of school, with only 1200 students. Click on the link above, for the (slightly lame) interactive version… NB this is me still trying to get my head around Tableau! The Hidden Curriculum refers to the unwritten rules, values and normative patterns of behavior which students are expected to conform to and learn while in school. The Hidden Curriculum is normally contrasted to the ‘formal’ curriculum which consists of the formal programme of specific subjects and lessons which governments, exam boards and schools designs to promote the educational achievement of students. A weakness of the concept of the ‘Hidden Curriculum’ is that most, if not all of the expected patterns of behavior are, in fact, written down and thus formally encoded in school rules, and students usually have to formally agree to them through their school’s tutorial system, so whether theses factors make up a truly ‘Hidden Curriculum’ today in school is, to my mind, questionable. whether there is an emphasis on academic success, and/ or artistic or sporting achievements. 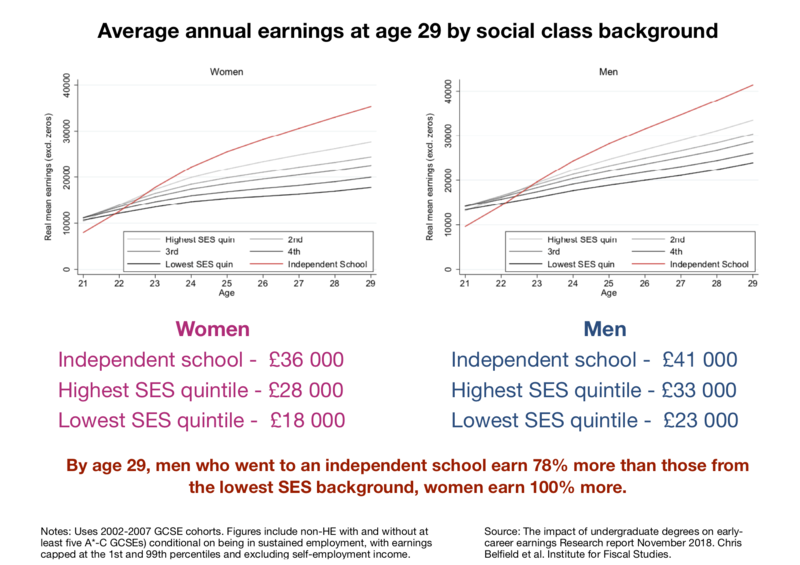 whether there is an emphasis on equal opportunities for all students – does the school focus on helping disadvantaged students, for example? whether there is an emphasis on respect for diversity – does the school promote multiculturalism and anti-racism and sexism? Whether the school encourages students to participate in community life. The extent to which there is an entrepreneurial culture and strong ties with local businesses at the school. whether parents are encouraged to get actively involved in the life of the school. The type of learning a school encourages – whether formal, traditional ‘chalk and talk’ learning, or independent learning, for example. Functionalist sociologist Emile Durkheim saw Education as performing two major functions in advanced industrial societies – transmitting the shared values of society and simultaneously teaching the specialised skills for an economy based on a specialised division of labour. Durkheim, a French sociologist, was writing at the turn of the twentieth century (late 19th and early 20th) and he believed that schools were one of the few institutions uniquely poised to assist with the transition from traditional society, based on mechanical (face to face) solidarity, to modern society, which was much larger in scale and based on organic (more abstract) solidarity. According to Durkheim ‘Society can survive only if there exists among its members a sufficient degree of homogeneity: education perpetuates and reinforces this homogeneity by fixing in the child from the beginning the essential similarities which collective life demands’ (Durkhiem, quoted in Haralambos 2013). Education does this by instilling a sense of social solidarity in the individual – which involves instilling a sense of belonging to wider society, a sense of commitment to the importance of working towards society’s goals and a feeling that the society is more important than the individual. Durkheim argued that ‘to become attached to society, the child must feel in it something that is real, alive and powerful, which dominates the person and to which he owes the best part of himself’ (Durkheim, quoted in Haralambos 2013). Education, and in particular the teaching of history, provides this link between the individual and society. If history is taught effectively, it ‘comes alive’ for children, linking them to their social past and developing in them a sense of commitment to the social group. Durkheim argued that, in complex societies, school serves a function which cannot be fulfilled by either the family, which is based on kinship or friendship, which is based on personal choice, whereas being a member of wider society involves learning to get on with and co-operate with people who are neither our kin or our friends. School is the only institution capable of preparing children for membership in wider society – it does this by enforcing a set of rules which are applied to all children, and children learn to interact with all other children on the basis of these shared rules – it thus acts like a society in miniature. Durkhiem argued that school rules should be strictly enforced – with a series of punishments for those who broke the school rules which reflected the seriousness of the damage done to the social group by the child who broke the rules. Durkheim also believed that by explaining why punishments were given for rule breakers, children would come to learn to exercise self-discipline not only because of fear of punishment, but also because they could see the damage their deviant behaviour did to the group as a whole. ‘It is by respecting the school rules that the child learns to respect rules in general, that he develops the habit of self-control and restraint simply because he should control and restrain himself. It is a first initiation into the austerity of duty. Serious life has now begun’. (Durkhiem, Quoted in Haralambos, 2013). Durkheim argued that a second crucial function for education in an advanced industrial economy is the teaching of specialised skills required for a complex division of labour. 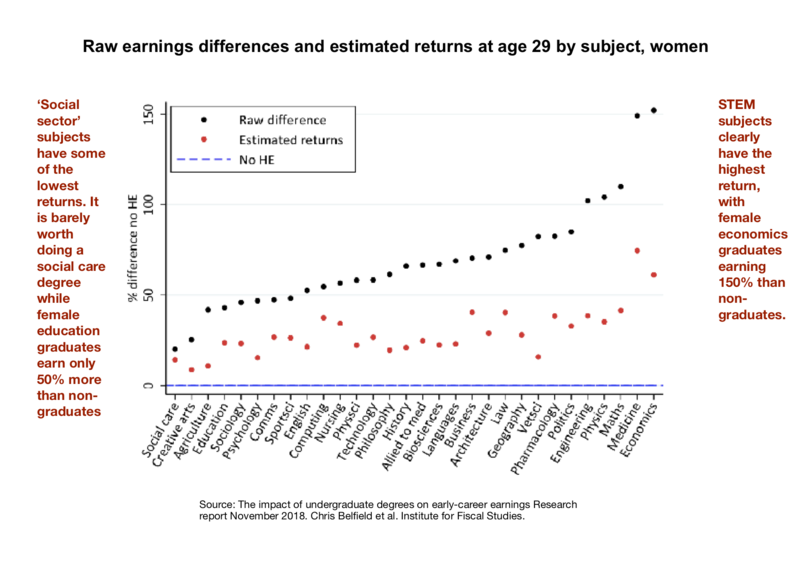 In traditional, pre-industrialised societies, skills could be passed on through the family, or through direct apprenticeships, meaning formal education in school was not necessary. However, factory based production in modern industrial society often involves the application of advanced scientific knowledge, which requires years of formal education to learn, thus schools become much more necessary. Another factor which makes school necessary in modern societies (according to Durkheim) is that social solidarity in industrial societies is based largely on the interdependence of specialised skills – the manufacture of a single product requires the combination of a variety of specialists. In other words, solidarity is based on co-operation between people with very different skill sets – and school is the perfect place for children to learn to get on with people with different backgrounds. 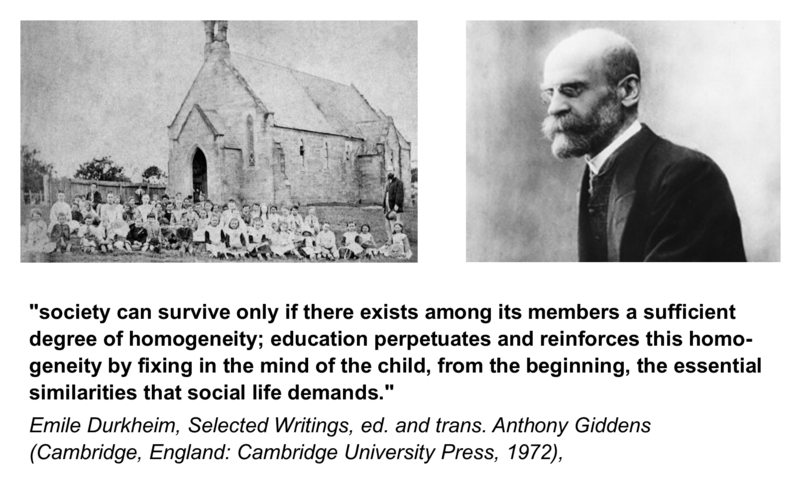 Taking the above two points together, Durkheim argues that schools provide ‘the necessary homogeneity for social survival and the ‘necessary diversity for social co-operation’. Postmodernists might criticise Durkheim for his assumption that society needs shared values – Britain has become much more multicultural in recent decades, and the extent to which there is a single British culture is debatable – there are whole communities which are largely cut off from mainstream culture, as evidenced in the case of ethnic segregation in Oldham. Marxists would be a bit more cynical about the relationship between school and work – according to Durkheim school is a neutral institution which simply transmits values and skills to individuals which enable the economy to run smoothly – according to Bowles and Gintis’ Correspondence Principle, this is a much darker process – school teaches working class kids to be passive, making them easier to exploit in later life. Ken Robinson in his ‘changing education paradigms‘ talk makes a number of criticisms of the contemporary education system – he argues it’s failing too many kids. Liberals such as Ivan Illich would even question the view that we need schools to transmit complex skills – In ‘Deschooling Society‘ he suggested that we could learn work related skills in a much more decentralised way, something which is even more possible today in the age of online learning.